Autoclear, comprising of the Control Screening X-ray and Scintrex Trace brands is an American manufacturer of X-ray machines for hand luggage and cargo and mobile applications, and handheld and desktop trace detectors of explosives and narcotics. As well as from all African Countries. For more information, visit www.a-clear.com and please feel free to visit our booth or contact us directly at eu@a-clear.com to arrange a meeting. We are currently looking to expand in several key markets. 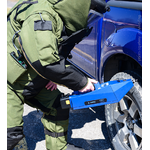 At Autoclear, niche security products are our domaine, specializing for several decades in the manufacturing of x-ray inspection units, from a tunnel size of 35x45cm up to 2x2 meters, as well as portable and desktop trace detection units used for pinpointing small trace amounts of explosives and/or narcotics.